According to the U.S. Judicial Panel on Multidistrict Litigation (JPML), all pending federally filed Cook inferior vena cava (IVC) filter lawsuits will be consolidated and centralized before U.S. District Judge Richard L. Young in the Southern District of Indiana, for coordinated pretrial proceedings. This order by the JPML establishes a nationwide federal Multidistrict Litigation (MDL) in one courthouse. This MDL will include all product liability and personal injury lawsuits involving side effect complications with Cook IVC filters. What are Cook IVC Filters? Cook IVC Filters are small metallic spider-like devices implanted by doctors to prevent blood clots from traveling from the leg (known as a deep vein thrombosis) to the lungs and causing a pulmonary embolism (blood clot in the lung). There are two main models, the Cook Celect and Gunther Tulip filters. The devices are commonly used when anticoagulant therapy is contraindicated because of bleeding risks or has not been effective. 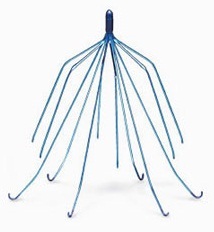 There are over a 100 complaints filed across the U.S. in various federal courts, alleging that design defects with Cook Celect and Gunther Tulip filters make the devices subject to fracture, migrate, tilt or perforate the inferior vena cava, aorta or other vital organs. According to an April 2012 study in the Cardiovascular Interventional Radiology, researchers found that 100% of Cook Celect and Gunther Tulip IVC filters perforated patients’ venal cava wall within 71 days of implantation. The study also revealed that 40% of the filters became tilted and out of position. A study published in the medical journal JAMA Internal Medicine in March 2013 questioned the effectiveness of IVC filters, finding that less than 10% of filters evaluated in the study were successfully removed from patients and 8% of recipients of IVC filters suffered a pulmonary embolism despite the device’s presence. In August 2010, the FDA issued a warning about the risk of IVC filter side effects, warning that the agency had received hundreds of adverse event reports where filters broke free and migrated to other areas of the body or caused perforation types of injury in organs and blood vessels. In May 2014, the FDA urged doctors to remove IVC filters within about one to two months after the risk of a pulmonary embolism has passed, highlighting that many doctors were not adequately warned about the importance of retrieving the devices. In complex product liability litigation involving either defective pharmaceutical or medical product devices, it is common for MDL proceedings to be established to reduce discovery, avoid conflicting rulings from different Courts and to serve the convenience of the parties. After the MDL is up and running, Judge Young will order a group of cases in the MDL for early trial dates. The 10 to 12 cases will be picked by the defendants and plaintiffs and be set up for specific discovery. These early trials are known as “bellwether” trials and they are designed to help the parties determine how juries may respond to similar evidence and testimony that is repeated throughout the litigation. Another major manufacturer, C.R. Bard, of these IVC devices has been exposed to several hundred lawsuits. Similar claims have been filed against C.R. Bard in recent years involving side effect problems with their Bard Recovery IVC Filter and Bard G2 IVC Filters. According to the complaints, Bard knew for years that their IVC filters were prone to fracture, which can cause severe side effect complications, including death, but failed to warn doctors and patients. These cases were never consolidated in a MDL, and Bard has been recently quietly settling these personal injury and product liability cases nationwide.